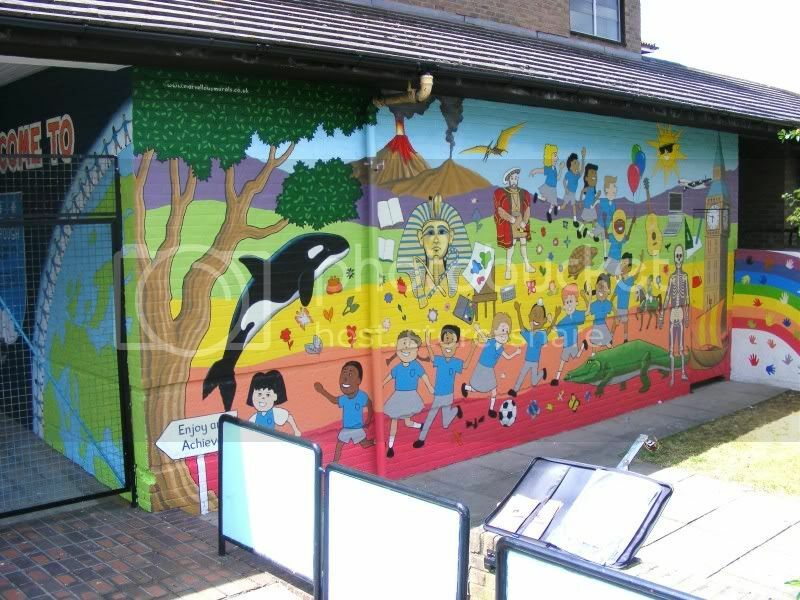 This is a large exterior mural at the front of a primary school and nursery in Southall, West London. It is 11ft high, the main wall is 30ft long with a 12ft long left hand wall leading to the entrance door and a small wall to the right behind which are some steps. The entire mural is painted in long lasting exterior acrylic paint and then coated in anti-graffiti varnish. 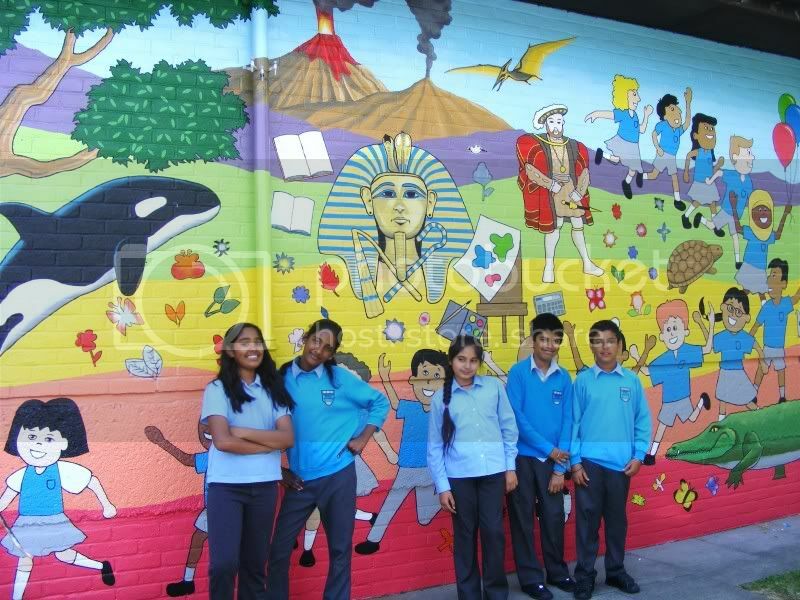 The pupils were involved in many aspects of this mural. Many of them drew designs of what they would like to see painted on the wall and I based my design on many of their ideas. The final design was approved by the schools children council. It emphasises the multi-cultural aspects of the area with the children surrounded by curriculum subjects. Once I had finished painting a majority of the mural some of the children made stencils of leaves, flowers butterflies and bugs that they held in place for me to spray onto the wall. Even the nursery children were involved, drawing around their hands to make stencils which were applied to the Rainbow wall. The wall leading to the entrance door on the left shows the school badge with a large welcome sign. Children from many different cultures hold hands around the world. 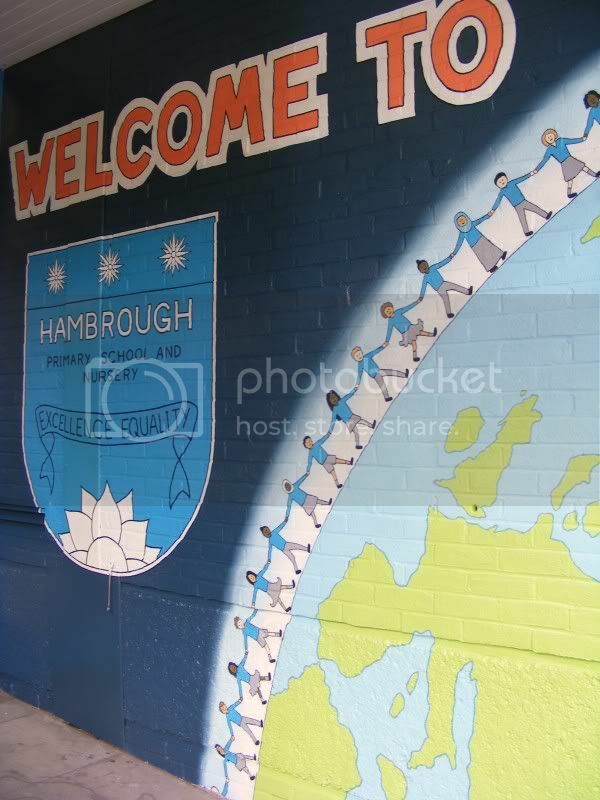 The entire mural took 20 days to complete and all the children and the staff really enjoyed seeing it develop and all agreed that it had transformed the front of the school which looks out onto a busy high street.